While a couple of weeks in the sunny climes of Rio would do most people a world of good, the Cidade Maravilhosa wasn’t so kind to the United States Women’s National Soccer Team. The odds-on favorite to leave Brazil with shiny new medals around their necks, the team’s 4-3 loss to Sweden in the quarterfinals meant the US women would endure their worst Olympics to date, failing to qualify for the gold medal round for the first time. It wasn’t exactly a summer to remember. Drama happening off the field overshadowed the on-the-field issues. Case in point, starting goalkeeper Hope Solo got herself into hot water due to some poor sportsmanship and unkind post-game comments in which she called Sweden “a bunch of cowards.” A pending assault charge following a 2015 incident with Hope’s sister and nephew also provided more than enough distractions for the USWNT. By the time the 2016 Olympics came to a close, it was clear the USWNT couldn’t get out of Brazil fast enough. Time to regroup and start building for the future. In September, the USWNT scheduled a pair of friendlies. The first was a match against Thailand in Columbus, Ohio, on September 15. The U.S. won handily, 9-0. The next contest scheduled for just three days later would be far more difficult — a date with the Netherlands in Atlanta. The afternoon of Sunday, Sept. 18, was wet, stormy, and, gloomy with rain coming blindingly hard at times. Fortunately, the US’s game with the Netherlands was indoors at the Georgia Dome just a stone’s throw from the city’s new multi-purpose stadium, Mercedes-Benz Stadium. The construction scene is a fitting metaphor for tonight’s game. As crews work to build the structure to prepare for the city’s new MLS team — Atlanta United FC — head coach Jill Ellis is planning for the future of the U.S. Women’s National Team as well. The roster that evening included a group of younger national team players and new call-ups, all hoping to impress the coaching staff and earn more playing time as a handful of competitive tournaments begin popping up on the schedule in 2017. Included on the active roster were a pair of Georgians, Morgan Brian and Emily Sonnett, who were thrilled to be on home turf playing for the U.S.A.
“It’s such an honor to put on this jersey and play for your country, but to do it in front of friends and family, it just means so much,” says Brian. A native of St. Simons, Georgia, Brian, 23, is a starting midfielder on the USWNT, having first made the leap from the U20 squad in 2013. At the time of this writing, she’s made 63 appearances with the USWNT, and logged six goals with the senior squad. She was also a member of the 2015 team that won the 2015 Word Cup in Canada. Even with the success on the international level, playing in front of loved ones is a huge thrill. “My friends and family helped get me here. So to be able to play in front of them in Atlanta, and my parents live here now, so it’s a pretty special place for me,” Brian said. 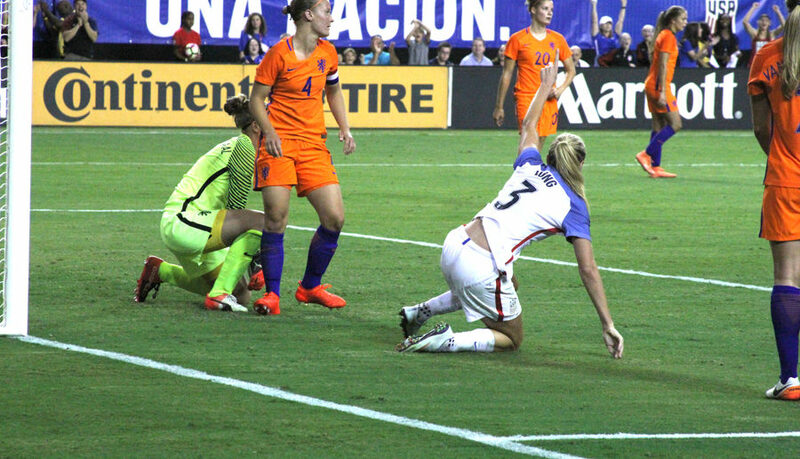 As for the action on the field, it took some time for the USWNT to find themselves, spending the first 20 minutes of the contest looking slow and lethargic as the Netherlands controlled the ball and the pace of play in the early going. 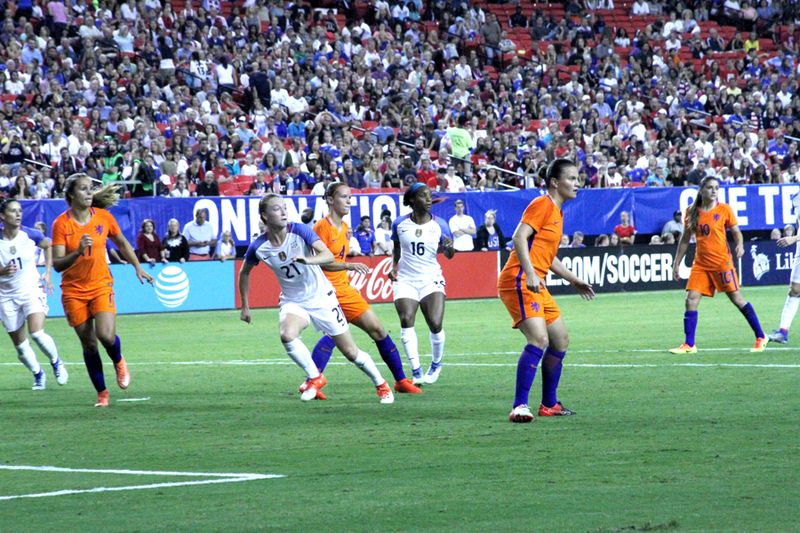 Netherlands striker Shanice van de Sanden surprised the U.S., and the nearly 20,000 fans in attendance, by scoring in the first two minutes of the contest. 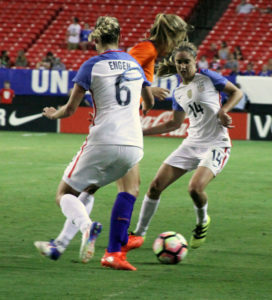 However, by the midway point of the first half, the U.S. found its chemistry and picked up their energy level, pulling the game to a 1-1 draw as Carli Lloyd put one in the back of the net in the 35th minute. The second half, however, is when the U.S. finally came alive, putting pressure on the Netherlands’ defense and controlling the ball for the remainder of the game. 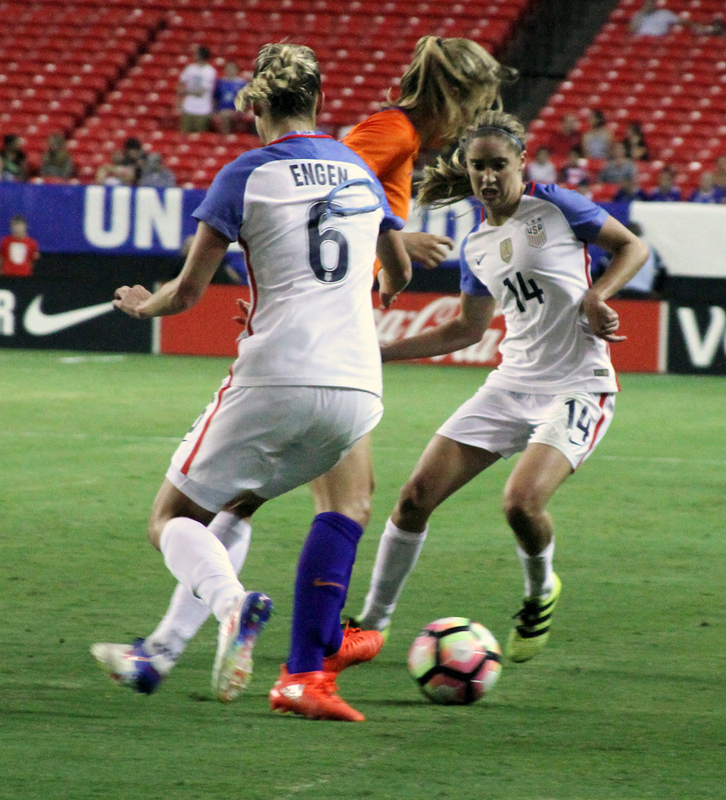 Their aggressiveness paid off in the 50th minute as the U.S. forced an own goal off of Netherlands defender Mandy van den Berg to go up 2-1. 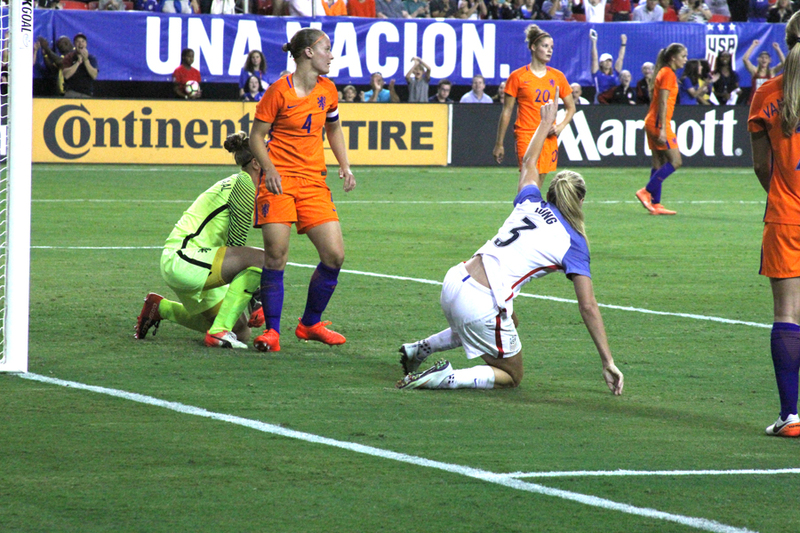 In the 77th minute, Allie Long scored to put the game away as the U.S. cruised to victory over the Netherlands, 3-1. For the coaching staff and the players, the difference between the UWNT’s performance in the second half made all the difference. 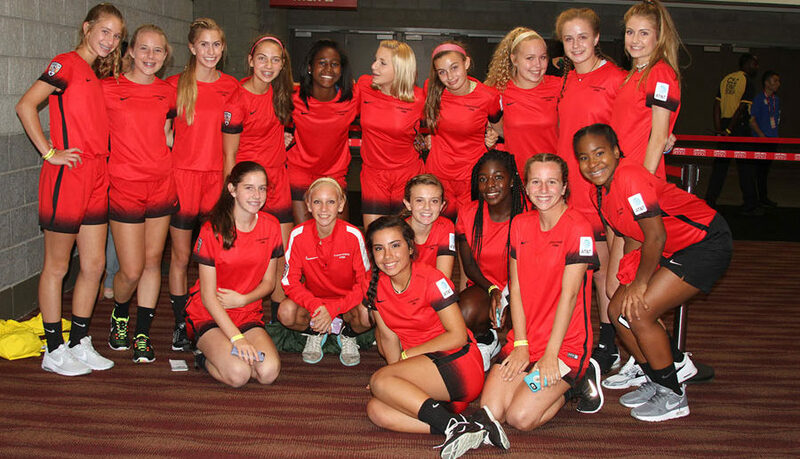 In the stands of the Georgia Dome for the US Women’s National Team friendly with the Netherlands were thousands of youth soccer players all decked out in their uniforms and holding signs supporting their favorite players. However, one group of young ladies had the chance to be up-close and personal during the match. 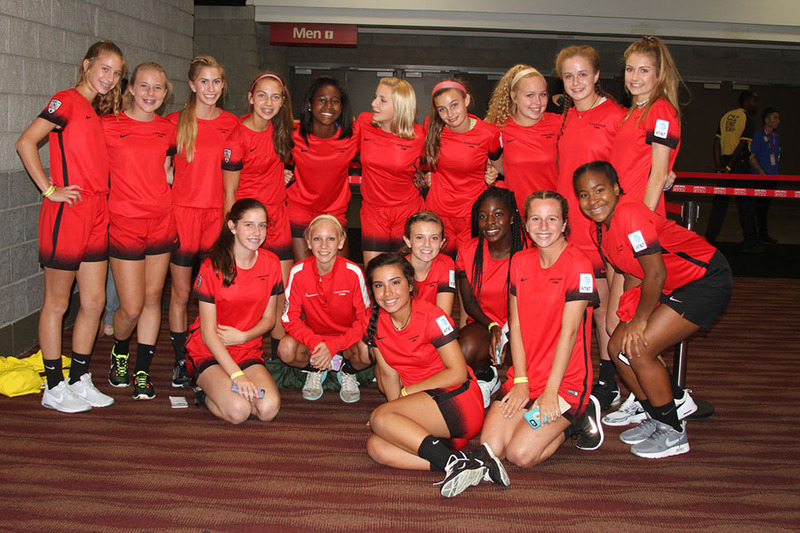 The Concorde Fire Soccer Association U14 Central Elite team served as ball girls for the game, and had the opportunity to line with both teams during the national anthem, pose for photos, and see their heroes play just a few feet from where they stood during the game. It was an exciting night for these girls, including Delaney Doss and Ryleigh Jenkins, an experience they will never forget. With dreams of playing for the Women’s National Team one day, Delaney says her favorite player on the current roster is Georgia native Morgan Brian. “I just like the style of play she uses. I like how she moves the ball,” she says.